The players were in pre-season training at the end of June and the gruelling calendar began with a couple of Europa League adventures against Breidablik and Aalesunds. Ross Forbes had the distinction of our first goal of the season when his second half effort found the net against the Icelanders in front of 6,000 at Fir Park. The league kicked off a month after our first game, on a Sunday, and despite getting the opener and dominating the first half we managed to lose 3-2 at home to Hibs. 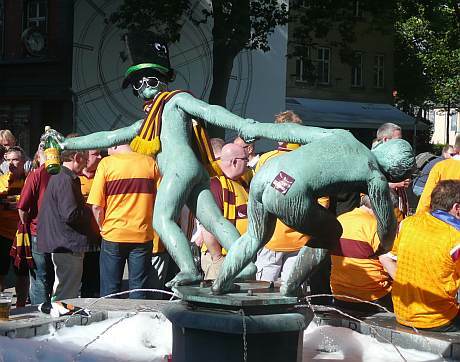 By the Thursday we were in the beautiful town of Odense. For the 500 ‘Well fans who made the trip this was one of the highlights of the year. Tom Hateley’s last gasp free kick in front of the travelling support gave us hope in the return leg but our involvement in the Europa League ended there. At least we had reached our seeded level. 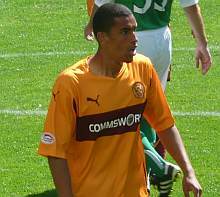 Our first SPL win came when Nick Blackman’s first goal for Motherwell gave us an unlikely three points at Rugby Park. We then lost to Celtic before embarking on a five game unbeaten run (including a CIS cup win in Brechin) that had us in third place in the table after seven games. Craig Brown’s management kept us there until mid-November and laid a solid basis for what was to become a top six finish. A notable feature of the first half of the season was the contribution made by Blackman. He scored ten goals in his spell with us, including a hat trick against St Johnstone, and we are grateful for his efforts. At the same time we have to recognise the contribution made by Craig Brown in those happy times. We entered a dark spell as November gave way to December. Six games with only two points from a possible 18 brought the early season optimism to an end. To add to our woes our management duo decided to take Aberdeen’s shilling. The manner of his departure did not reflect well on a man who had traded long on his good public image. We had an unexpected search for a new manager at a critical time in the season.